Good Morning Everyone. !So glad you’re here. 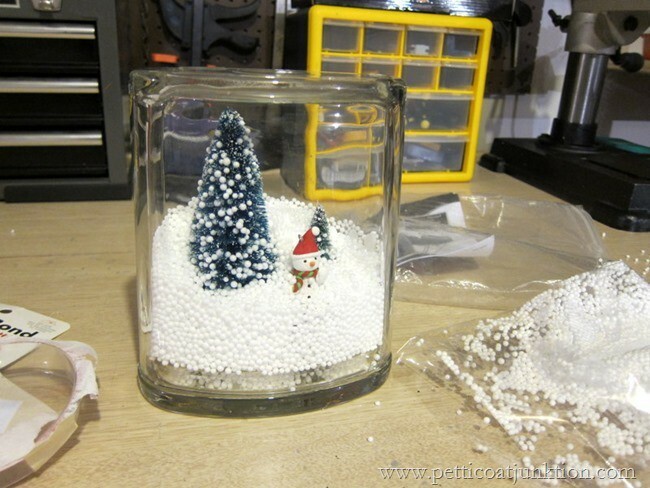 Wait till you see my winter snow scene in a jar. It was one of those trial and error projects. 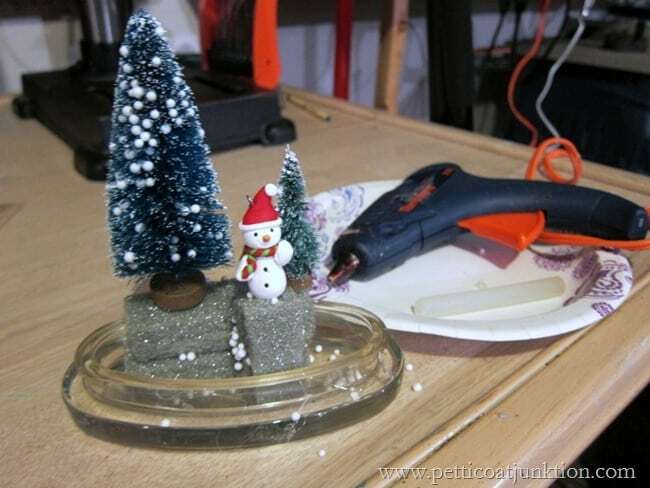 I’m trying to get started on Christmas crafts and have worked on several but they never seem to turn out right. This one did…..after a lot of work. 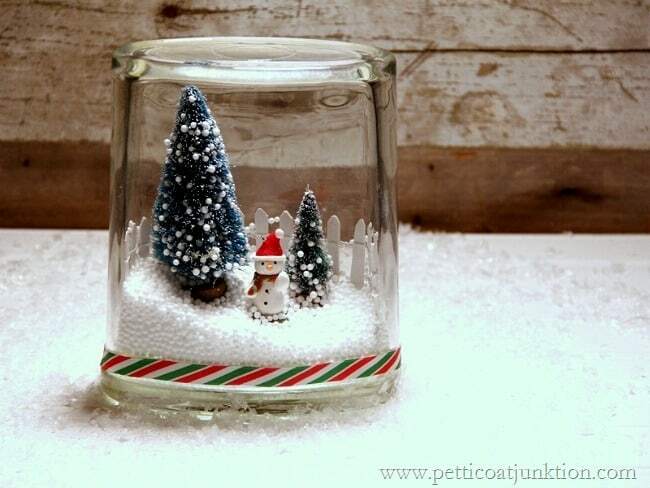 I’ve been seeing these lovely snow scenes in jars on my favorite blogs and also on Pinterest. Anyone else see those? They look easy to make and so much fun. I love the miniatures in the jars. I went to Hobby Lobby and bought a few things to work with. I already had all the jars and everything I purchased was 50% off. 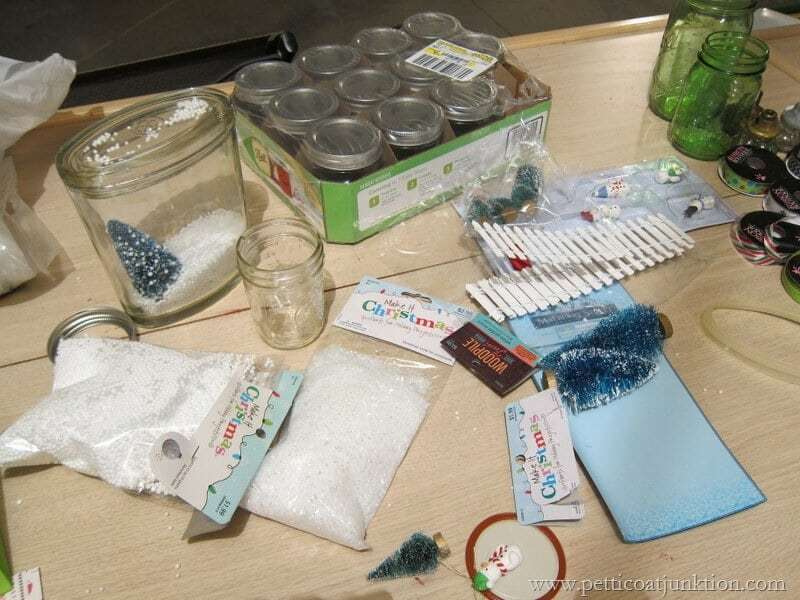 At first glance the project seems easy but I found out differently. See the tree in the jar on the left. I thought I could just plop the things in the jar and be done. Wrong. 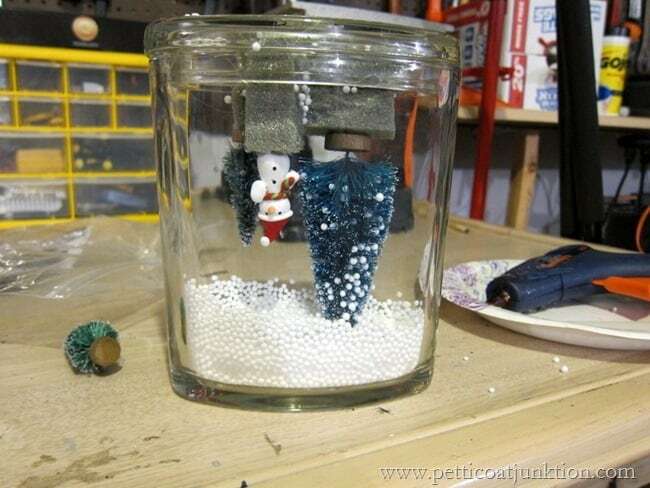 The items have weight and they just sink into the “snow”. So here’s what I did. I pulled out my trusty glue gun, a few pieces of Styrofoam and went to work. 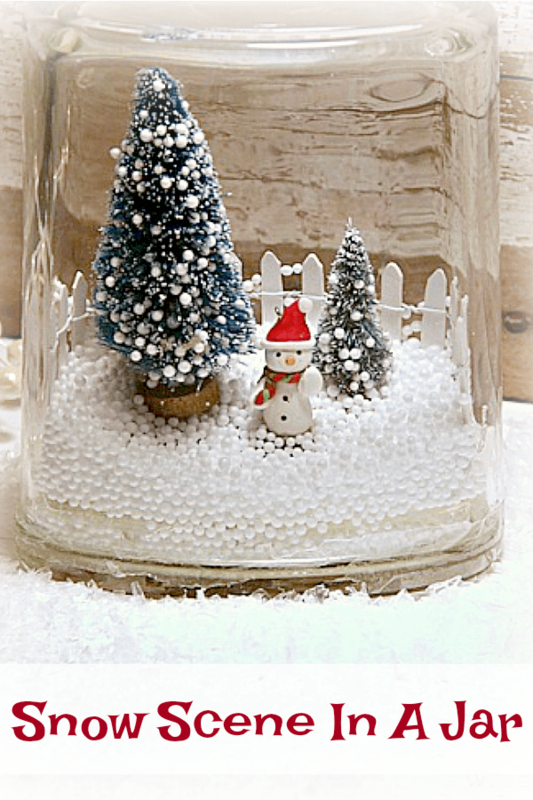 As you can see I glued everything to the top of the jar. By the way, I purchased the jars on a yard sale trip for 25 cents each. I think I got 5 of them. Then I turned the jar upside down. Not enough snow…. …and I forgot the fence. I hot glued the fence in place….added more snow…. …..too much snow this time. I finally got the proportions right….at least they work for me! 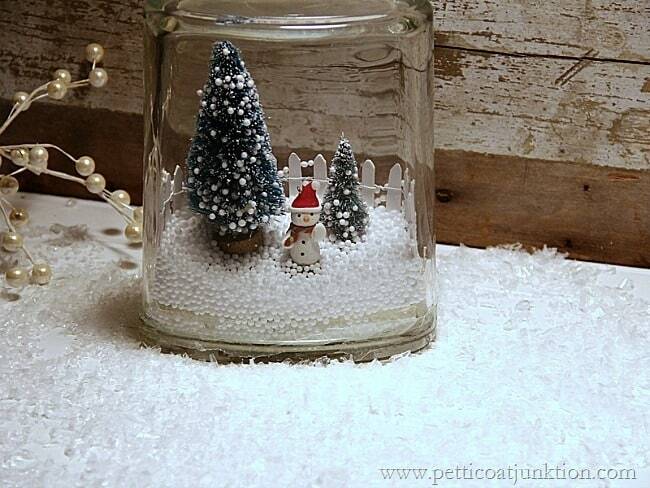 I’m going to try some other Winter scenes with Ball Jars and different miniature items. Now that I’ve had a little experience things will be easier the next time. Stay tuned. Find my Gumball Machine Winter Scene here. I was just wondering where you found those miniatures! 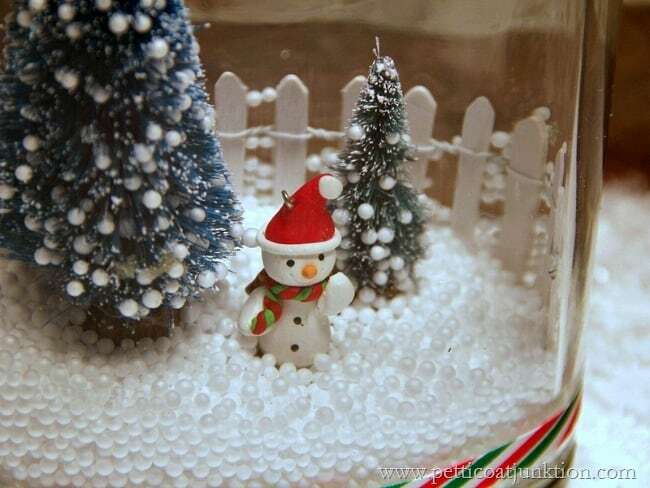 I have looked everywhere, and would love to get some of those snowmen! Amanda, I got them at Hobby Lobby! Thanks for sharing. 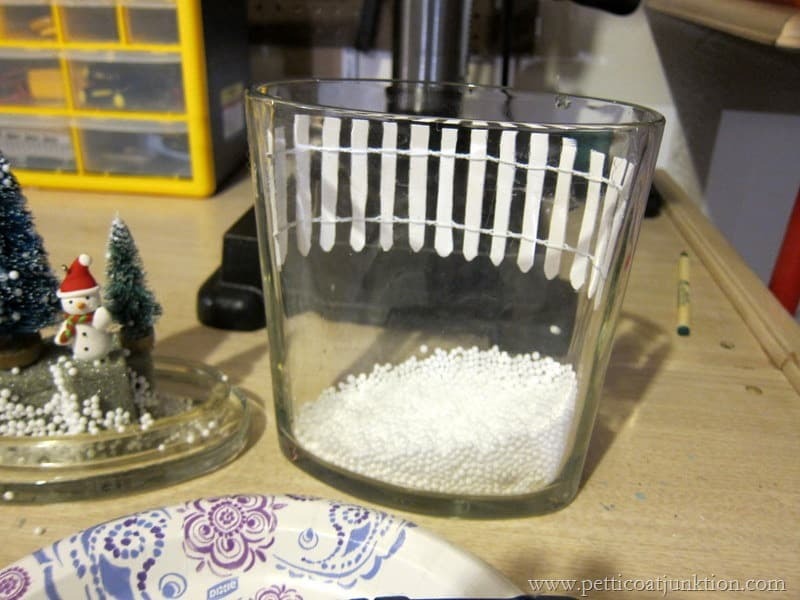 I did see these on Pinterest; but so glad to hear the detail of what works and doesn’t. I love the “too little snow” and “too much snow” scenarios. So funny and real. These are adorable. You inspire me. You are so smart young lady, you sure beat me to doing this. Where’s good place to buy the miniatures? Maybe will look at $tree and Hl and wherever I can buy them at price i can afford. Love shape of those jars you used. 25cents, oh man. Lucky you. You have the talent for finding best junk/stuff. 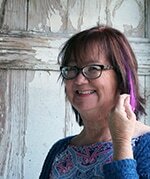 We’re going to be in craft show on 12/13 so am gathering ideas of things to make. EAsy quick things that won’t be expensive. HOpefully will sell. First time in craft show for us in very long time. Your little scenes are so darned cute. 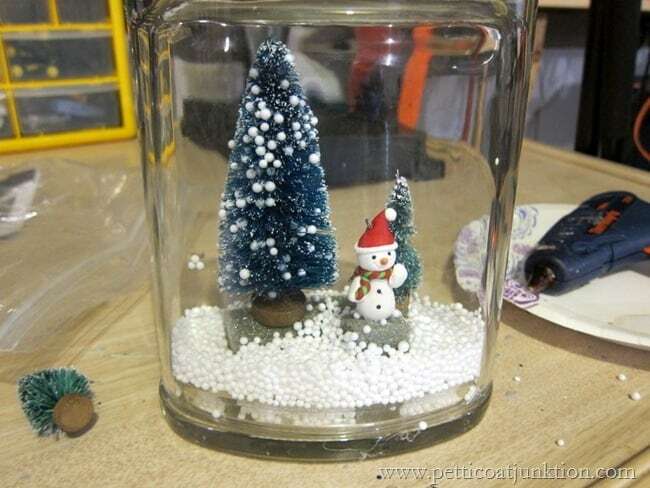 I did that with cloches and jars on our shutter shelf last holiday time. I need to get some of that cute fencing. Hope you are enjoying the pre-holiday working on things. I’ve been madly gathering ideas to make. SUggestions? I have a couple of suggestions. How ’bout using white styrofoam chunks to lift the items to the “snow” line. That way, it isn’t as noticeable if the “snow” drifts away from the figures. Alternatively, you could paint the foam bases white or wrap them in white felt or fabric before gluing them. I love this idea. 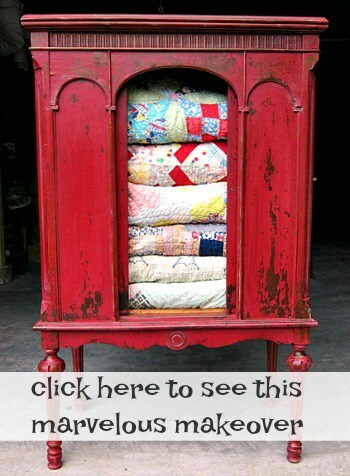 Really cute, I have only made one and it wasn’t as goo as yours maybe I will give it another try. Very cute-Thanks for the tips on how to make them. I have purchased all the goodies to make these pretty babies. You’ve given me some great do and don’t so thank you!! Can’t wait to make them! I had grand ideas of making snow globes last Christmas but there were so many different ideas out there I got stymied and never did anything. Still have all the stuff to do it, perhaps I’ll give it a shot this year? :)Thanks for the trial and error! Very cute Kathy! Aren’t they fun to make. I just made a few that’ll being going up on the blog in a few weeks that I’ll add to my mantle this year. Its so enchanting! I love it. Perfect details!